The City of Calgary has begun a long-term project to connect the Inglewood Wildlands, the Inglewood Bird Sanctuary, Pearce Estate Park and the adjoining existing green spaces in the community of Inglewood, called Bend in the Bow. The City of Calgary is engaging the public on a new project to connect the Inglewood Wildlands, the Inglewood Bird Sanctuary (IBS), Pearce Estate Park and the adjoining green spaces along the Bow River. The project is called Bend in the Bow. Learn more detailed information about the project at calgary.ca/bendinthebow. Our goal throughout the engagement and development process is to explore and address ways to preserve, enhance and celebrate the only urban-centred, federally-recognized bird sanctuary in Canada, while retaining the historic significance of the other lands located within the area boundaries. We want Bend in the Bow to tell stories of Calgary’s beginnings as a city. This area is where modern Calgary began, and it is rich in nature, history and culture. This park space will explore, celebrate and share those stories. Thank you to everyone who provided feedback to date. There will be one more opportunity for input in September, more information will be posted when it is confirmed. Bend in the Bow’s vision is to tell stories: stories about our city’s beginning, our impact on the land and how our culture was shaped by our environment in each of the three parks that the project represents. In Phase 2, a Public Open House took place on May 19, 2016. To see what was shared at the Open House, view Open House Information Boards. Throughout 2015, we met with a variety of external stakeholder groups, deployed on-site sounding boards at the bird sanctuary, and posted an online public survey to gather feedback from the public. This feedback was used to shape the preferred final design for Phase 1 of Bend in the Bow. The Phase 1 What We Heard Report #1 and Phase 1 What We Heard Report #2 provide a deeper review on what was discussed and what we heard at the engagement sessions. The Phase 1 Wrap Up presentation explains how the preferred design concept evolved. Please see the Phase 2 What We Heard Report #1 and the Phase 2 What We Heard Report #2 for up to date information on the process. Once Phase 2 is complete, the two phases will be combined into a single plan for the area. This will be presented to the public later this year, and to City Council in 2017. Phase 1 of this project is now completed. It focused on the Inglewood Bird Sanctuary and the Inglewood Wildlands. A summary on the engagement process and what we heard is posted under the We’re Listening tab. 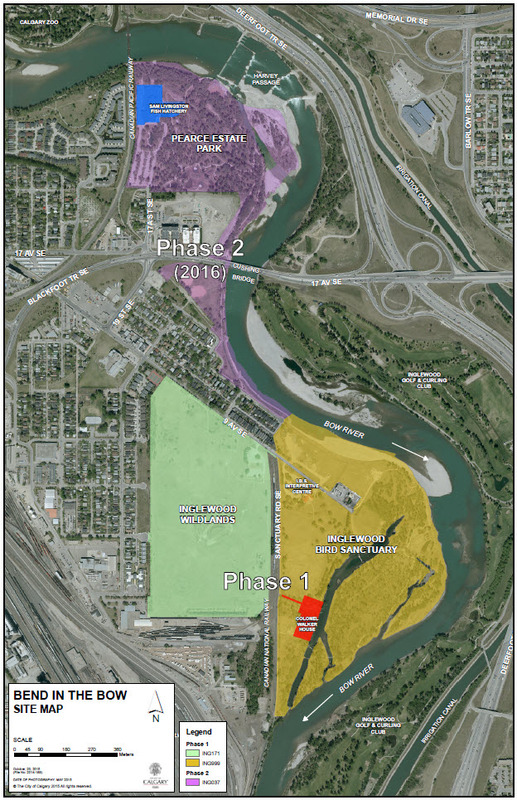 Phase 2 focused on Pearce Estate Park and the open space along the Bow River toward the Inglewood Bird Sanctuary. The Phase 2 stakeholder presentation was made available for people to reference before providing input. The feedback gathered helped us shape a design concept for Pearce Estate Park and the adjoining open space, and was presented to stakeholders (organizations and community partners) on May 17 and the public on May 19 for further feedback.